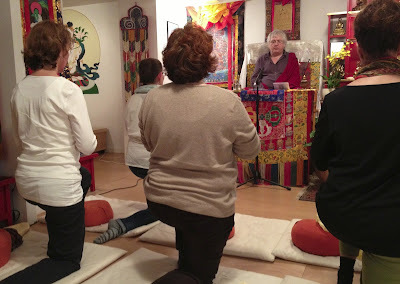 Lama Jampa Thaye arrived on Friday the 1st February and was received and hosted by Wolfgang and Hilde Staufner, the administrators of Sakya Dechen Ling, Stuttgart. On the Friday evening Lama Jampa visited the Centre, and presented a short talk on the qualities of the three jewels of refuge, the benefits of taking refuge as well as the commitments involved. Lama Jampa then proceeded to bestow the vows of refuge to five people wishing to become Buddhist. Other members of the Sakya Dechen Ling sangha were also present to welcome new members into their numbers, and also make use of the opportunity to re-new their own refuge vows. The following day was a day of teaching, Lama Jampa continuing with part three of the famous text written by the Indian master Nagarjuna, The Friendly Letter, together with its commentary called The Telescope of Wisdom, written by one of Lama Jampa's own masters, Lama Karma Thinley Rinpoche. Listening to the detailed explanations of this profound but easily accessible text written by Nagarjuna at the request of a friend, who was a king, who wished to know how to apply the Buddha's teachings to his busy life, the intervening centuries disappeared, for we too are somehow wealthy and somehow also too busy, and it is clear that we can also fully apply the contents to our own situations. Lama Jampa reminded us that if we hear, study and become fully familiar with this text, then we can say that we have a good foundation in all aspects of the Buddha's Mahayana Dharma. After the teaching Lama Jampa gave the textual transmission for the Sakya 'ngondro' - vajrayana foundation practises. This is in preparation for a short 'ngondro' retreat that will take place in Sakya Changlochen Ling in France in May. Preceeding this retreat, Kunga Gyalten will lead a weekend 'introduction to ngondro' at the beginning of March. Lama Jampa also bestowed the textual transmission of the short Chenrezig Sadhana called 'Filling Space to Benefit Beings', which will be recited together by the sangha on Sunday evenings. On the Sunday morning Lama Jampa gave the initiation of Manjusri, bodhisattva of wisdom, followed by the textual transmission of the short sadhana written by Sakya Pandita. At the end of the proceedings Wolfgang thanked Lama Jampa for bestowing the holy Dharma, and looked forward to his return in June. Wolfgang also invited the Sangha to a Losar Tibetan New Year celebration on the following Sunday, which will include the traditional changing of prayer-flags, cleaning the shrine, and tea & cakes!